Description: “Stand with Rand 2016: A Dashboard Analysis of a Predecessor’s Success and a Current Candidate’s Road to Victory” is a written analysis of the current status and historical trends of a candidate’s key performance indicators accompanied by the visual representations or graphical presentations which should enable instantaneous and informed decisions to be made at a glance. 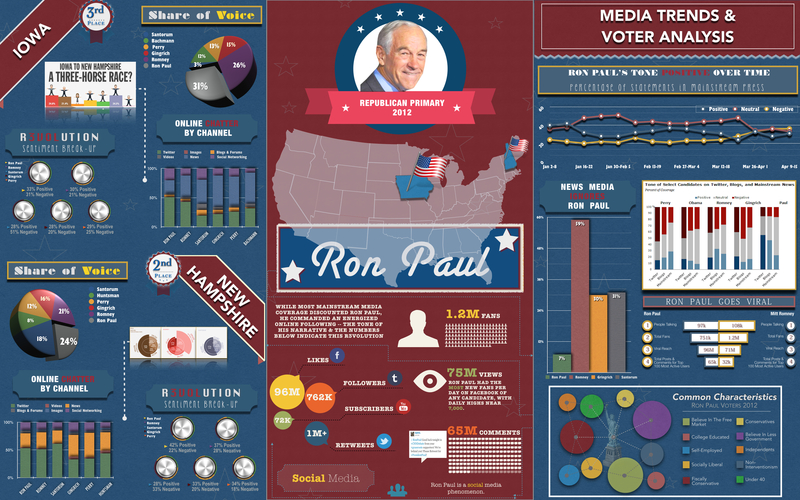 For accompanying information, please see the “Ron Paul Dashboard: Primary Election 2012 Recap based on Social Media Metrics & Polling” and the “Rand Paul Dashboard: Electability based on Social Media Metrics & Polling” located in the Design section of this portfolio. All research, data, steps, tools & analyses are factual. However, “The Rand Paul Campaign 2016” section, which begins on page 11, is a hypothetical. This paper and accompanying dashboard is NOT associated with the official Rand Paul 2016 Campaign in any way!